Hoosier Salon Prize System | Kappa Kappa Kappa, Inc.
Tri Kappa started the purchase prize system for the Hoosier Salon. The first piece purchased was Edward K. William’s canvas “The Hoosier Cabin.” Thus, the Tri Kappa art collection was started. "Perhaps many of you are wondering just how the picture was chosen. Since this is the first year that our award has gone to purchase the picture, it was necessary for Tri Kappa to have their own committee. The Hoosier Art Association will not accept the responsibility of selecting a purchase picture, but will when the award is simply a gift to the artist. The Tri Kappa committee was composed of Mrs. Merrill Davis (Marion) state art chairman, Miss Hallie Bortz (Warsaw) grand president, Mrs. Walter Hadley (Gary), and Mrs. Carl Davis (Valparaiso). Miss Lucy Hartrath of Chicago acted as our guide and advisor in our tour of the galleries. The committee met in Marshall Field's Galleries on Saturday, January 23rd at ten o'clock. Strange to say, we Tri Kappas had no trouble in getting together even in Chicago." 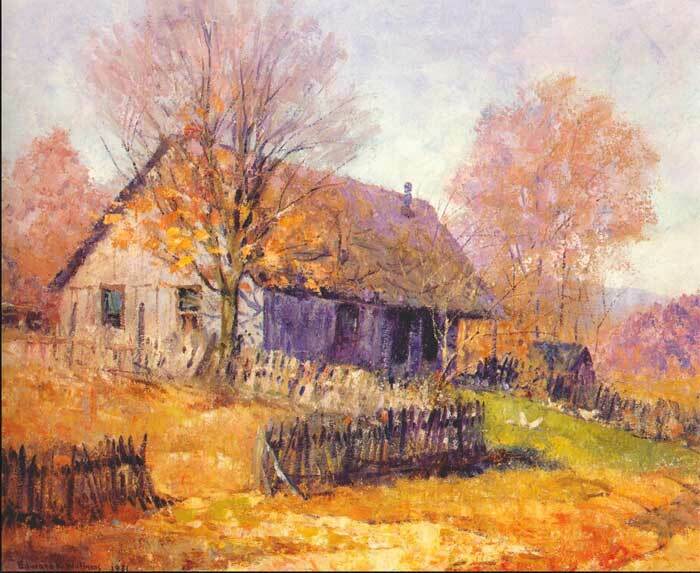 Also of interest: Landscape painter, Edward K. Williams was born 1870 in Greensburg, Pennsylvania. Williams studied at the Art Institute of Chicago with Freer, Vanderpoel, Fursman, and Krehbiel. He exhibited there as well from 1903-1929 (including many winter scenes). He also exhibited at the Hoosier Salon, New York Watercolor Club, Herron Art Institute, American Watercolor Society, Brown County Art Gallery Association, and the Chicago Gallery Association. He was president of the Brown County Art Gallery Association and the Indiana Art Club.